In this second volume of the Mission and Education series, two Australian Catholic educators face squarely the issue of the Catholicity of the entire formal curriculum – what is involved, and why it is a vital matter for the consideration of all those committed to the education of young people in Catholic schools. A learned and thoroughly researched study, this book should fruitfully enlighten and encourage discussion of curriculum in Catholic schools. An excellent book that combines intricate knowledge and understanding of updated curriculum thinking with piercing insight into the challenges implied by such thinking for Catholic schools. The book challenges a range of facile approaches to being a Catholic school in a public setting, including that the Catholic school can ignore its wider public context or that being Catholic means simply adding a layer of RE to an essentially public enterprise. The book goes to the heart of the justification of Catholic schooling by illustrating a range of differences that might be notable in a distinctively Catholic Curriculum. In a day and age of much talk about Catholicity and Catholic Identity, the D’Orsas make it plain that there is no simple formula, nor can it ever be viable that there is only one way of being Catholic. ‘Catholic Curriculum’ is a complex term that can only be meaningfully applied in the real context of a multitude of societal influences and educational stakeholders. 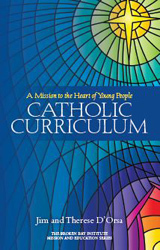 The book’s stated task is to reframe the conversation around Catholic Curriculum, a goal well achieved in my view.